Employees moved carts at Vermont Packinghouse, a slaughterhouse in North Springfield, Vt.
SPRINGFIELD, Vt. — In the last five years, Black River Produce, a wholesale distributor of fresh food, has doubled its sales and staff and added a much-sought-after slaughterhouse in southern Vermont as demand for locally produced food continues to climb. Sales have tripled for Pete’s Greens, a four-season organic vegetable farm in northern Vermont that sells wholesale to stores and restaurants and to consumers partly through its Waterbury store, a farmers’ market, and its community-supported agriculture program, where members get a weekly share of produce and other foods throughout a season. The farm has also expanded its acreage and the number of CSA members in the last five years. At Harlow Farm in Westminster, revenue went from about $1.1 million to $1.75 million and they’ve nearly doubled their seasonal staff in five years. The organic vegetable farm also expanded its sales through wholesalers to southeastern states like Florida and Alabama. Around the state, Vermont has added 5,300 food-related jobs between 2009 and 2014, according to the Farm to Plate annual report presented to the Legislature this week. That growth comes with a rising demand for locally produced foods. ‘‘A lot of it has just been the changing of the marketplace,’’ said Sean Buchanan, president of Black River Produce/Black River Meats. When the business first started distributing locally raised produce in the late ’70s, some customers, like restaurant chefs, were skeptical and still are. Local produce often wouldn’t be quite perfect: tomatoes would taste great but would be soft or vegetables would have aphids, said Black River co-founder and co-owner Mark Curran. ‘‘When we were doing local food it wasn’t cool,’’ Buchanan said. Vermont ranks first for its commitment to raising and eating local food, followed by Maine, New Hampshire, Oregon, and Massachusetts, according to a 2015 Strolling of the Heifers Locavore Index, which relies on US Department of Agriculture and Census figures. The rankings are based on the number of farmers markets and CSAs per capita as well as the dollar volume of food sales by farmers directly to the public. 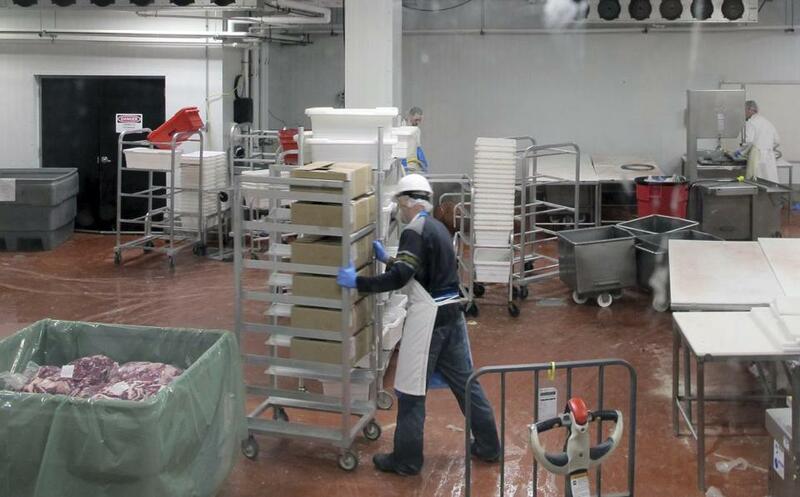 That demand for local food, a shortage of meat processing plants in Vermont, and a desire to get locally raised meat into supermarkets and beyond prompted Black River to convert a former Ben & Jerry’s plant in North Springfield into a slaughterhouse and processing plant that opened in the summer of 2014.
Business at the slaughterhouse, called Vermont Packinghouse, is growing quickly and exceeding its five-year projections. It started with 10 employees a year and a half ago and now has 50. About half of the business is from Black River and the rest is from 150 farmers, and other meat product producers. It now processes about 65-70 beef cows and 120-130 hogs a week and is booking three months out in the fall and 6-8 weeks now. ‘‘The meat expansion for us was not only to build that infrastructure for what we felt was going to be the growth in our business, but was also the ability that independent producers could process and slaughter there and be able to get their meats to whatever market they deemed fit,’’ Buchanan said.